About Living Dead Media: Living Dead Media is an independent media company operating in Los Angeles, bringing the “Living Dead” to life across the media landscape in 2018 and beyond. 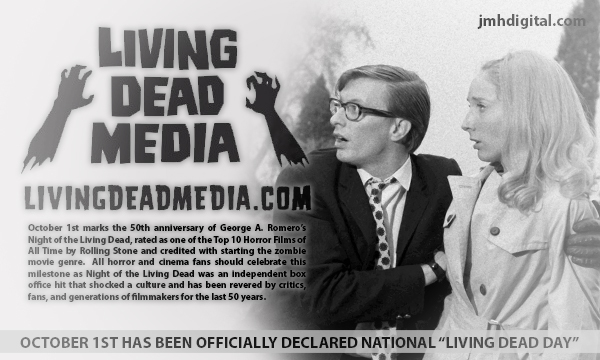 Living Dead Media’s projects include partnering with Image Ten Productions and Janus Films in the 2018 worldwide release of the remastered Night of the Living Dead (1968), the upcoming first-ever George A. Romero’s Night of the Living Dead mobile gaming app, and the original film’s never-produced sequel, to be released as Night of the Living Dead Part II (2019). In addition, Living Dead Media is rolling out a truly masterful Night of the Living Dead Ultimate Fan Collector’s Box Set through a partnership with FYE stores. For more information, visit www.nightofthelivingdead.com or www.facebook.com/officialnightofthelivingdead. Fifty years! And he launched a whole new genre.